As I told ya'll earlier, I am the March Guest Designer for 2 Cute Rubber Stamps. I just can't get enough of these cute images!!! 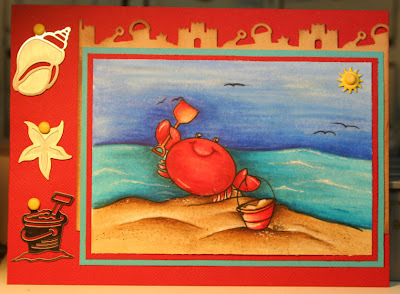 For my first card, I chose to use their Happy Crabby digi stamp. Psssstttt......want to know how you can get this adorable little guy for free? Check out their first challenge here. Make sure you scroll all the way to the bottom of the post for the rules of the challenge and instructions on getting this adorable little guy yourself. Check out the awesome samples made by their talented DT! And if you think he is cute, take a gander at the other images they offer. The owner, Heidi shows you her sketches on her blog here, and wow, are they great!! Hope you all try the challenge. Have fun and good luck!!! Oh Christina - this card is ADORABLE!! Probably one of my favorites from you! Great card - it's adorable! Christina, this card is wonderful! It looks like a little piece of art to hang on the wall at a summer home! I love all your little touches! Thanks for sharing and being our GD for Mach! Thanks for being this months guest designer! I absolutely love this card. Wow, this is absolutely gorgeous! The background is just amazing! Love your coloring! And that image is darling!